Are You Looking For A Centennial Airport Limousine? Centennial Airport limousine transportation service that Denver Limousine Inc. provides is perfectly in tuned with what the city itself is portrayed; wholesome, safe and diverse. Centennial is known as one of the safest cities in Colorado while having a little something for every person including distinctive recreational activities, open space and great business opportunities. Centennial is a place where you can see the value they have for education with them having Cherry Creek School District and the award winning Littleton Public School as top districts in the state. Centennial has even been ranked by USA Today among the "Best place to live" in America. A big factor into why Centennial has been put on the list of best places to live in America is because of it's dedication as a known leader in successfully using both private and public partnerships to give great quality and cost effective municipal services to businesses and community. Here at Denver Limousine Inc. we like to embody the mindset and feel of the city in which we are working in, so that means we see the importance of the people and business. Our Centennial Limousine services offers passengers the best airport limo service for your expediency, easing the conveyance of flying in for business or getting you out of the city for a vacation. Our Centennial Limo services are practical for both your commercial and personal commute to the airport. 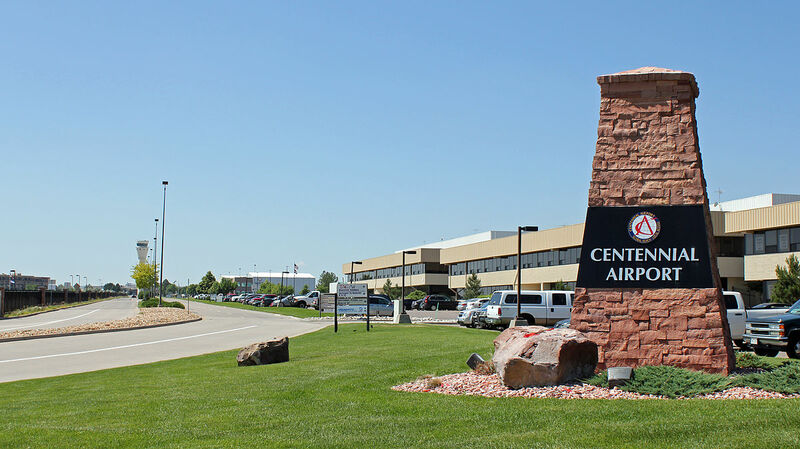 The Centennial Airport is international and has 24 hour Federal Aviation Administration control tower, all weather capability and 24 hour US Customs as well as. It has three runways and is commonly used for a variety of important flights; various medical flights, law enforcement, flight for life and more. It is also an important hub for trade and commerce keeping this airport busy as well as some others through out Colorado. With our service we guarantee fast, professional drivers that are fully aware of the area and the airport. Just because the airport is busy doesn't mean you have to feel that way to. We aim to take the stress away from work or just typical flying by giving you reliable service with our dependable fleet. We make sure to always inspect our vehicles before letting them go out for rides. For over ten years we have been giving exceptional service that satisfy any and every flyer. Denver Limousine Inc. takes pride in providing better safe, inexpensive and convenient airport limo transportation or private car service as other competitors. We have a variety of transportation options whether you are going to the Centennial Airport or coming from it. The best part about booking with Denver Limousine Inc. is that we are very knowledgeable of Colorado area. We are operated and started from the Denver area so it is our home too, and we know the fastest routes to ensure you get to where you want to be promptly. Everyone knows that limousine services are not perfect for every single occasion, but there a definitely times in ones life that calls for a bit of treating oneself and indulgence. When that time comes, ​Denver Limousine Inc. hopes you give us the opportunity to earn your business and trust. Our luxurious fleet of limos and our outstanding team of courteous and friendly drivers will guarantee complete satisfaction every time. If you are still left with the question of what are good reasons for hiring an airport limo service, we can definitely think of a few for you. Regardless of what type of transportation you are looking for we can provide it, so call us today or stay online to book your next comfortable ride from or to the Centennial Airport.